Sprinkle drumettes with salt and pepper to taste. Heat oil in deep-fat fryer or large heavy pot. When it is quite hot, add half the wings and cook about 10 minutes, stirring occasionally. When wings are golden brown and crisp, remove them and drain well. Add remaining wings and repeat process. Meanwhile, melt margarine in saucepan, add hot sauce to taste and vinegar. Pour hot mixture over wings and mix well to cover. 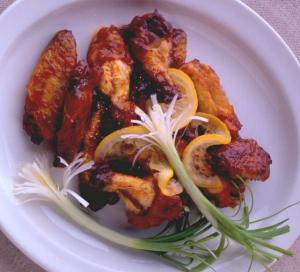 In this version, the wings taste especially good because they are baked, not fried. For mild wings, use just a dash of cayenne pepper and for hot wings, use 1/8 tsp cayenne. For RED-HOT wings, use 1/4 tsp. Preheat the oven to 425F. Place the wings on a rack in a baking pan and bake for 10 minutes. Remove the pan from the oven and reduce the heat to 400F. In a small bowl, stir together the margarine, hot pepper sauce, and cayenne pepper. Remove a small amount of the sauce and brush it onto the wings. Bake the wings for 10-12 minutes longer, or until crispy and cooked through. Pour the remaining sauce over the wings. Makes 4-6 appetizer servings.